Let Us Protect Your Trees & Shrubs from Insects! 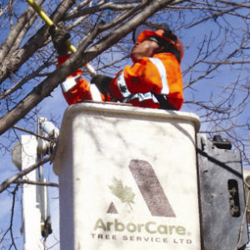 At ArborCare Tree Service, we provide Tree and Shrub Fertilizer to clients across Western Canada, including Calgary, Edmonton, Kelowna & Vernon to help protect your plants! Insects can pose a grave threat to your trees and shrubs, and at ArborCare Tree Service, we take that very seriously. Serving customers throughout Western Canada, we know our insect enemies, and we have tailored solutions specific to the particular threat that is posed. For instance, while oil sprays can be an effective way of combatting potential caterpillar infestations, if you’re faced with pine needle scale you may want to combine oil spray with an insecticidal soap treatment. Having the right combination of tactics, combined with the knowledge of how and when to use them, is what distinguishes us as the premier choice for fighting off the insects that would do harm to your trees. From aphids to weevils, we’ve seen – and dealt with – the full gamut of insect threats. If you think your trees or shrubs might be under attack, or if you’d like to learn more about what we can do to help, we invite you to contact us today to get started.